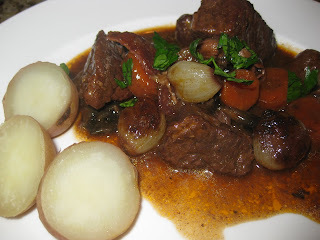 I cooked Boeuf a la Bourguignonne last night, the Julia Child's Boeuf Bourguignon :). I started out late around 7:30pm, and we had dinner at 10:30PM, but it was well worthy. It took me some time to mentally and logistically prepare to cook this famous and already iconic dish. I have read the recipe couple of times, found the right products, the right casserole, the right spices, etc. According to Julia, the casserole should be 10 to 12 inches wide and 3 inches deep. 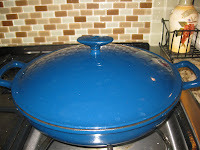 The enameled cast iron by All Clad Emerilware, I got recently, perfectly matched the requirements. 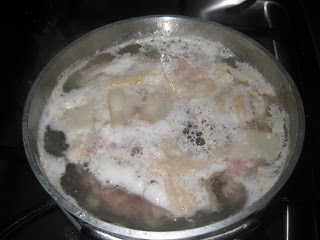 STEP 1: Cut the bacon and simmer it for 10 minutes, then drain and dry. 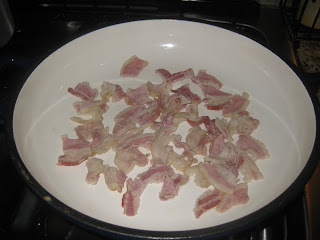 STEP 2: Saute the bacon in 1 tbsp oil in 10-12 inch casserole until lightly browned and remove to a side dish. STEP 3: In the bacon fat brown the beef. Make sure you dry the beef well with paper towel, otherwise it won't brown. Remove it from the pan. 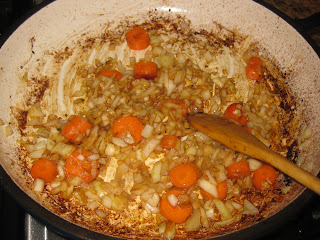 STEP 4: In the same fat, brown the sliced onion and carrot. STEP 5: Preheat the oven to 450F. Return the beef and the bacon to the casserole. If there is a lot of fat in the casserole you can pour it out. Sprinkle the salt, pepper and flour over the meat and toss it. Put the casserole in the oven for 4 minutes. Take it out, toss the meat again, and leave it in the oven for another 4 minutes. This browns the flour and covers the meat with a light crust. 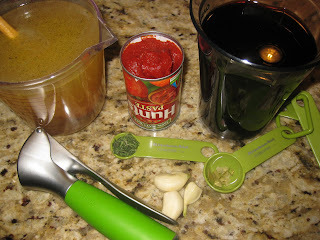 STEP6: Stir the wine, the beef stock, the tomato paste, the smashed garlic, and the spices in the meat. STEP 7: Cover the casserole and return to the oven at 325F for 2 1/2 - 3 hours. 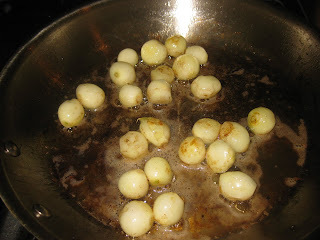 STEP 8: Meanwhile saute the mushrooms in 2 tbsp butter and 1tbsp olive oil. 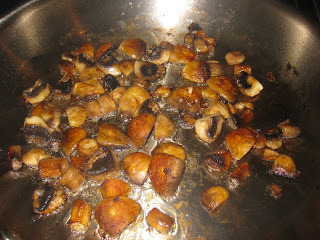 Don't crowd the mushrooms, brown them in two batches if needed. STEP 9: Brown the onions in 1 1/2 tbsp butter and 1tbsp oil. Be careful not to break them. Season them with salt and pepper and set aside. 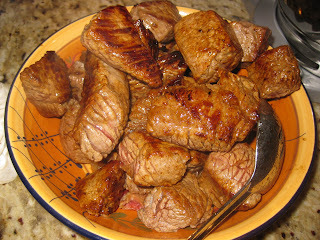 I use a convection oven and the beef cooked faster, it was done after only two hours. STEP 10: Take the casserole out of the oven. If you see a lot of fat, that is the time to get rid of it. Also if the sauce is too thin or thick you can fix it. 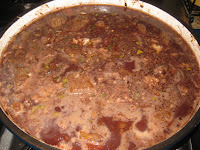 Put it in a separate bowl and add whatever is needed, flour or stock. I did not have to do any of these. 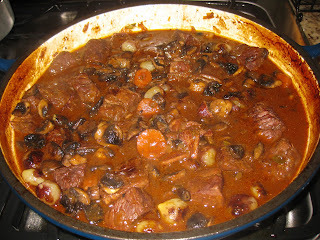 I just added the mushroom and the onions on top of the stew. You can serve with noodles, rice or with boiled potatoes, the way the French serve it. 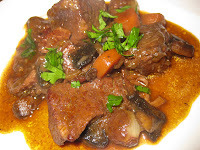 Sprinkle with parsley and pour a glass of Beaujolais, Bordeaux or Burgundy. 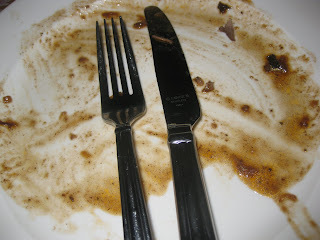 The dish exceeded my expectations. 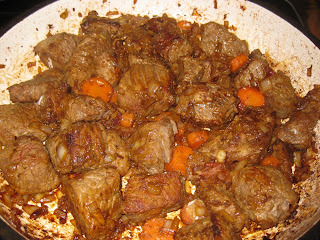 I'm not a big fan of these types of stews, but to be honest, this one was out of this world, or as Julia says " Carefully done, and perfectly flavored, it is certainly one of the most delicious beef dishes concocted by man..."
You are taking it to a whole different level, girl!!!!!!! !